Thanks for stopping by our Unbreakable-Bonds blog. We're currently closed for renovations...what, is that a collective mumble about it being about time??? You deserve to see something cool and worth the read here, so off we go to do our project. Stop by again soon and look for a new coat of paint, a couple new pictures on the wall, etc. Cheers! Back to the Future, Antique Chainless Bicycle! A lone surviving copy of a bicycle from another era, a chainless 3-speed relic manufactured in early 1900, has been recovered and is being restored; called "The Hill-Climber," it was the first multi-speed bicycle to be produced in America. A bicycle believed to be the first production model in America to employ multiple-speed gear ratios has been found and is being restored to original condition. When found, only the patented gear-changing mechanism was still attached to the rusty frame. A nationwide search for replacement parts and information about the company that produced it has been undertaken. The inventor of this 3-speed bicycle, Peter J. Scharbach, called it "The Hill-Climber." It was originally produced by Scharbach/Hoerth and Company in San Francisco in 1902. Research shows that the company also tried to produce an early automobile. It is not known how many of these bicycles were sold during its production years from 1902-1904. 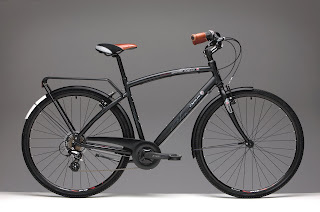 Chainless bicycles are manufactured today by a few companies, but the product form is not widely known to bicyclists. The surviving Hill-Climber, a frame with a shaft-drive (like an automobile) instead of a chain, has three bevel gears at the rear wheel, and shift linkage to change speed ratios. It was stored in the basement of a retired dairy farmer outside of Pe Ell, WA, after spending most of its life on his farm junk pile. His father, John K. Muller, and many residents of the area invested in a manufacturing company formed with the inventor in late 1903. Assembly operations were moved from San Francisco to Chicago in early 1904. Mysteriously, all their investment was gone by the end of the year, and the company folded. A descendant of the inventor was found living in Arizona. His great-grandfather was a blacksmith, inventor and entrepreneur whose patent for the chainless bicycle is still being referenced today. Remnants of the bicycle business are a few surviving photographs taken at a product roll-out event in Golden Gate Park, San Francisco, c.1902. An advertising flyer, and other surviving documentation, was found in the possession of relatives of John K. Muller. More information about the bicycle, its restoration, and its place in history can be found at http://www.fusionstudios.com/hill-climber. Well, this weekend, hubby and I got in a bit of riding and it was absolutely great! He's a happy camper riding his new bike, sporting a Kryptonite lock, bien sur...a beautiful Opus urbanista. 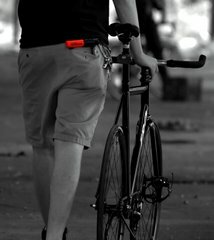 If you're not familiar with it, check it out...www.opusbike.com. Sorry, can't find 'em too easily in the States yet, but hopefully our neighbor to the north will decide to change that in the near future because they are lovely bikes to ride! Warm sun on our faces and a nice breeze at our backs (most of the time!). Of course, today there are a few sore muscles in places that I'd forgotten and a longing for some new cycling gear that I hadn't thought much about in the depths of the soggy month of June. But, I wouldn't trade those things for the world. Happy Days! For those of you who don't know I have an obsession for fishing. 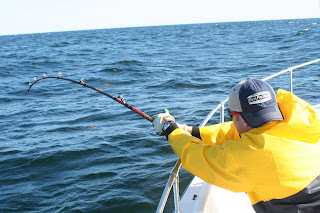 In the last couple of years I have honed my skills targeting Stripers and Bluefish in and around Duxbury MA. This year a friend and I decided to make a go at some Bluefin Tuna on Stellwagon Bank which is about 17 nm from Duxbury Bay. We headed out at 5:30am towards the grounds with some iffy weather. The total trip took us 35 mins and the seas were between 2 to 3 ft. Once at the location we hooked up the bait and let them swim. It was only about 5 minutes till the first fish took the bait. It was a very large and strong Bluefish, that once brought boat side, broke thru the 80lbs floro leader and took off. Next two fish were Stripers and were both between 25 and 30lbs respectively. We hung around for a while longer with some hits but not the type of hits we were looking for, so we moved into deeper water. Once we made it to deeper water our luck changed. The bird activity picked up to a frantic pace and the water began to come alive. Baits in the water, it was time to wait for a hook up and we did not have to wait long. My friend's bait disappeared in a wash of white foam and his line began to peel off his reel faster than anything I had ever witnessed before. We had hooked a Tuna!!! I put the boat in gear and began to chase down the fish, with my buddy reeling as fast as he could, but it wasn't long before we realized that this was a large Tuna. Once we were on the Tuna my friend began to try to muscle it in with no luck. The fish pinned him to the rail of the boat and only let him stand up to get some line when it wanted him to. After about 20 minutes of fighting, the rod was passed over to me. It wasn't until I had full control or thought I had full control of the rod that I realized how powerful these fish are. I consider myself to be in fairly good shape and this fish would not let me gain any ground on him at the beginning of the battle. I would try to stand and lean into the rod to get some line only to be pulled back down to the rail with authority. It was thrilling to say the least, until our luck began to change. I noticed that the reel began to move to the side of the rod as I reeled and I tried to tighten up the seat with no luck. The fish had started to break the rod and so the fight became more difficult. We began to gain some ground on the fish and knew we were getting close to getting this fish boat side, or so we thought. The fish began to give me a tour of my boat (literally) pinned to the rail he it went starboard aft, I went starboard aft and then back up to the bow of the boat. It made a quick dart around the bow as I lifted the rod, the line caught on the bow eye and SNAPPED!!!!! That's it….. as fast as it started it was gone. The ride back was a nasty painful hour and half ride into 4ft+ swells. It gave us plenty of time to understand what had just happen. We had hooked on to the freight train of the Atlantic. Here are three pic from my adventure. First one is where I think I have the upper hand, second is where I know I don't and third is where I'm wondering if it was a wise choice to go after a fish that potentially weighs 1/3 of my boats capacity! Good times had by all…even the tuna. P.S. Bluefin are a highly fished species. Please do your part to only harvest fish you need and return the rest for another day. First it was slow food and now its slow ride...Its really fun to see the explosion in interest in all things cruiser bikes! Our good friends at Kickstand Magazine have had tremendous response to their inaugural issue and are reporting numbers as much as 500-600 riders at cruiser rides they're holding across the country this summer. What a sight it must be to see! To get a hint of the good stuff you'll find in the magazine (look for it at a bike shop near you) check out www.kickstandmag.com or www.cruiserride.com. Also watch this space for more information about their ride calendar, should you want to check out some of the bikes in person. You'll see Kryptonite locks around the events for sure. Here at Kryptonite we've been picking up on an unsettling trend lately. Be aware and beware! It seems that in some cities enterprising bike thieves have been targeting bikes that can be easily broken, putting their own lock on the bike and leaving for later pick up. When they return what does the passerby see? Nothing out of the ordinary - a guy unlocking a bike with a key and riding away. Don't get me wrong, even a lightweight, flimsy lock can serve a good purpose, but when you need to make sure your bike isn't stolen, don't risk becoming a target like this. Make sure your lock is strong enough to do the job all day, or all night, until you return. Where Have We Been ?? Lesson learned about talking to our Kryptonite lock friends...it can be hard work to come up with pearls of wisdom each day. Sorry if you've been disappointed when you haven't found anything new here, but thanks for being patient until we got back on track. If you are like us, you are really happy that we've had so much wonderful rain this season, but enough is enough already. The weather has certainly put a damper on cycling activities in many parts of the country, but not so in New York. 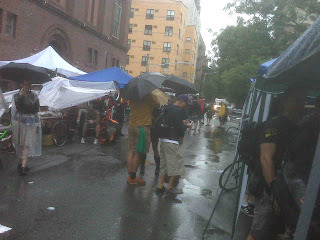 Eric, our National Sales Manager for bike spent a soggy weekend at the Bicycle Film Festival and was happy to chat with the stalwart souls who weren't going to be put off by a little water. 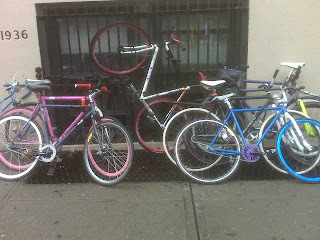 Some of them brought out their most colorful rides to try to chase away the funk. Welcome to Kryptonite's blog. Please feel free to stop, visit and chat....when you aren't out and about having a great adventure, that is. Here are just some of the places and events where you will find Team Kryptonite members soon. C'mon by and say "hi"! Team Kryptonite is out and about every day. You never know where you'll run into them over the holiday season. Say "hi" when you do.